“We are losing a Steelworker every 10 days, and that is unacceptable,” United Steelworkers Vice President Tom Conway told members gathering in Pittsburgh. In Cheyenne, Wyoming, 35 bells rang out in the State Capitol – one for each person who died on the job in that state in 2012. In Chaska, Minnesota, workers lay 34 orange hard hats in a line, to honor the Minnesota Department of Transportation employees who have died in work zones. In Los Angeles, members of the Southern California Coalition for Occupational Safety and Health (SoCaLCOSH) paid homage to the memory of workers like Cesar Valenzuela, who died in February on a service road at LAX. Valenzuela’s death is one of seven workplace fatalities profiled in "Preventable Deaths 2014,” released by the National Council for Occupational Safety and Health (National COSH) on April 23rd. 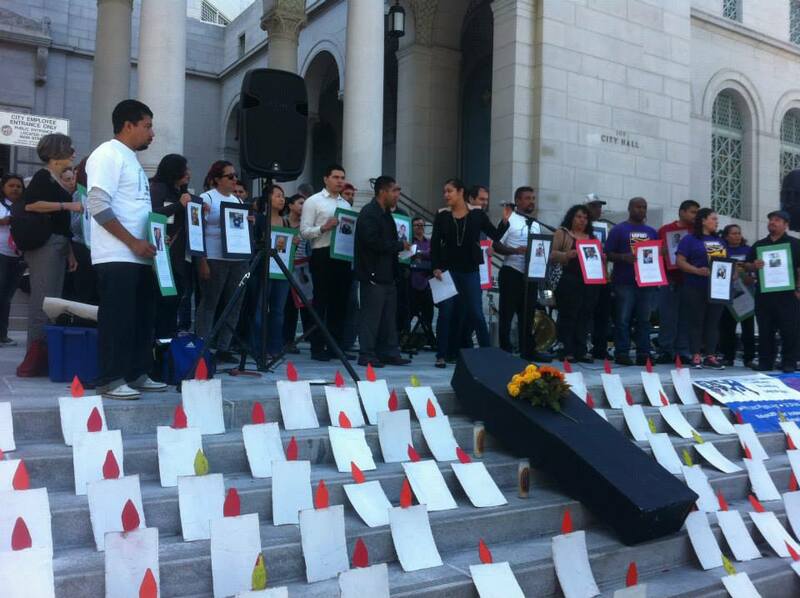 From SoCalCOSH’s Facebook page, participants in a L.A. City Hall press conference hold up photos of individuals who lost their lives on the job. Participants in Workers’ Memorial Week events did more than just mourn the dead; in union halls and public squares, activists spread the message that workplace fatalities are preventable, and that more must be done to avoid future tragedies. Workers and survivors across the country advocated for the specific steps to create safer, healthier workplaces. In Buffalo, speakers called on Congress to update the Protecting America’s Workers Act. In Boston, labor officials and workers’ advocates gathered on the statehouse steps to support legislation that protects workers and provides for families of those that die on the job. Beyond fatalities that take place in the workplace, participants at Workers’ Memorial Week events discussed the occupational exposures and subsequent illnesses that kill over 50,000 workers a year. During a telephone press briefing to announce the release of “Preventable Deaths 2014,” Javier Garcia Hernandez, a construction worker who works as a consultant and trainer for PhilaPOSH, discussed the dangers posed by exposure to hazardous materials. The COSH report details the dangers of silica dust, a silent killer, and provides recommendations for reducing the hazards. And the hundreds of Workers Memorial Week events reminded people around the world of the unsafe conditions faced by millions of workers, and of the measures necessary to prevent the tragedies that we mourned last week. You can read press coverage of COSH groups’ participation in Workers’ Memorial Week activities here. Preventable Deaths 2014 is on the National COSH website here. In addition, local COSH groups – in New York, California, Massachusetts, Wyoming, Tennessee, and Texas – have written state-specific reports. A summary of these studies can be found here. They are indispensable for understanding and correcting the underlying causes of worker fatalities in specific regions and industries.